After their set, I turned my back on the stage for a few minutes to collect my thoughts and rifle through the pictures I had taken. The crowd had grown larger, which I like to see in a venue as small as the Black Cat. When I turned back around to get ready for the next band, I was pleasantly surprised to see that the instrument range seemed to have expanded. Dios meant business, as we were soon to find out. 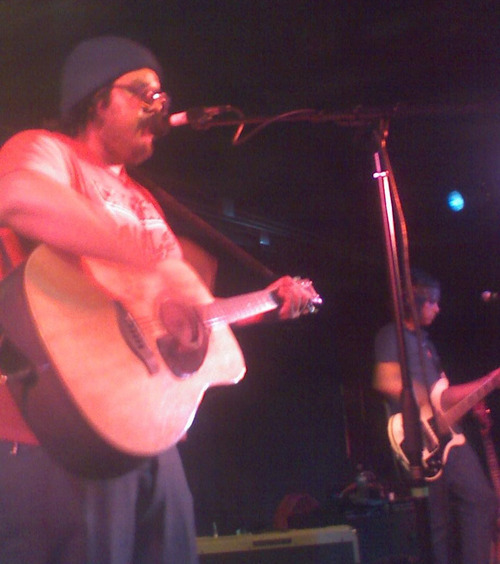 Joel Morales, the singer-guitarist, drove the band to near psychedelic/rock epiphany. He warmed us up with early David Bowie-like vocals and strummed his way into the depths of many a trippy mindset. The rest of the band was on board, complete with his eyes closed, swerving and swaying to the piano-driven melodies while he took a break from his over-exaggerated beats and blasts. It was quite a cacophony of sound, but one that was pleasant to the ear. I would definitely be interested in hearing more of their stuff. After their set was over, the stage was taken over by two sets of percussion, as well as the normal concert fare. The Fiery Furnaces burst onto the stage in all of their storytelling glory, bringing us into a 70s era poetry jam. Eleanor Friedburger became the revolutionary frontwoman, giving us her tales of third-world travel, steam machines, and doughnuts. She rattled off list upon list of non-repetitive words and phrases, stringing one song into the other with her little hops and scissor kicks. The two drummers, Bob D’Amico and Joe Lambert dueled each other in a trippy, cowbell filled battle, with both of them eventually standing up, heads down, eyes closed, in full hammer-down ecstasy. Eleanor’s brother, Matthew Friedburger, calmly sat at his keyboard, wide eyed and quite innocent looking. 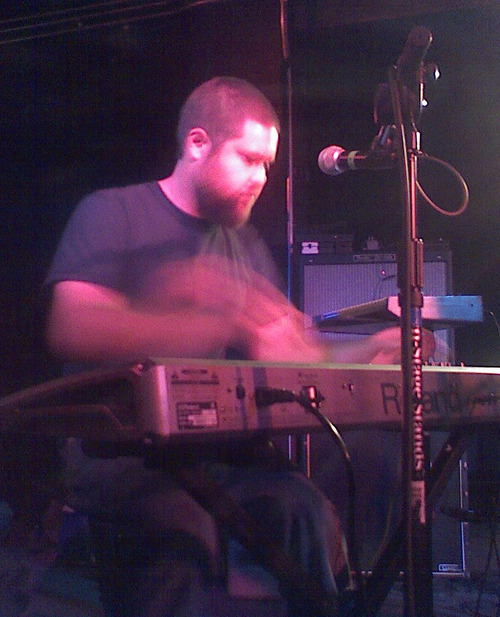 His organ rock and synthpop rhythms created a carnivalistic feel and made the drums start to feel too repetitive. Eleanor and Matthew reminded me a bit of the White Stripes, only with a little more panache. The guitarist Jason Lowenstein happened to steal the show, in my mind. He played riff after riff of pure rock idolatry, creating quite a contrast to the state fair atmosphere of the remaining team. After awhile, it became hard to discern one song from the other and it became a 2 hour musical journey with no real dénouement. They mainly played songs from their newest album, Bitter Tea, although a few of their older songs, including Tropical Iceland and Here Comes the Summer. In all, it was a good show. The bands really played off of each other well and I could see why they were touring together. It’s always nice for me to see bands that play for the fans or each other, not for the fame. It creates more of a connection with the audience at a smaller venue and I think that everyone feels a bit more appreciated when it comes to the love of music. Nice pics, I love the last one. the transportive quality of the fiery furnaces comes across vividly here. while it's difficult to tell songs apart, as you said, it's not difficult to identify a real dedication to the creative process in all of these bands. Doughnuts, steam machines, and third-world travel... interesting! I've never really listened to the Fiery Furnaces, but it sounds cool. "Doughnuts, steam machines, and third-world travel... interesting! 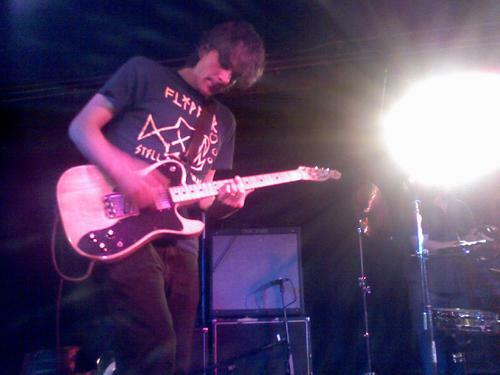 I've never really listened to the Fiery Furnaces, but it sounds cool." I recently caught the FF on their stop in Raleigh. You've captured the essence of their live show with words-- which is hard to do. I stuck around after the Raleigh gig to chat with Matthew and Eleanor. They both come across as down-to-earth normal folks, not affected as some rock stars are wont to be.